The Global Financial Crisis highlighted the need to better understand the role of financial fluctuations for the performance of the overall economy. In a recent paper we analyze global financial cycles over the past 150 years across a sample of 17 advanced economies. An important innovation in our analysis is that, for the first time, we now have long-run data on credit growth, house and equity prices, as well as equity share dividends. A simple way to assess common movements in credit, house prices, and equity prices internationally is to calculate 15-year rolling window correlation coefficients. Figure 1 shows that harmonization in financial cycles has risen substantially over time. 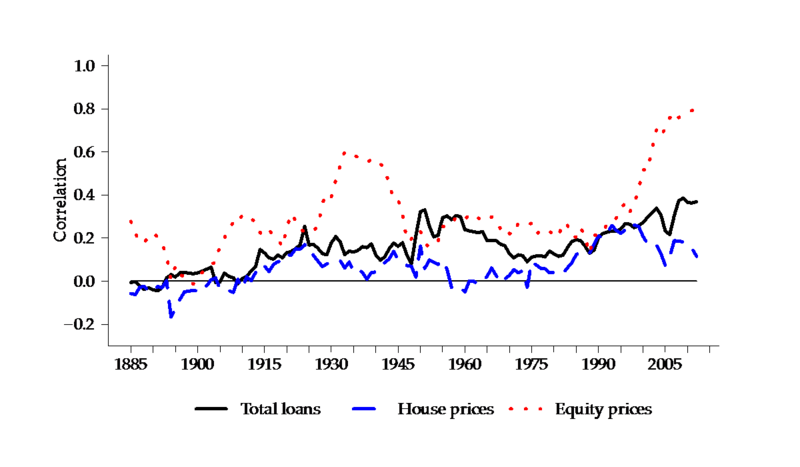 The comovement of credit and equity markets is at a historical peak today, with correlation coefficients of about 0.4 and 0.8 respectively. Particularly notable is the rise in equity price correlation. Since the 1990s, this correlation has continued to increase, now reaching near perfect global integration, and far exceeding the correlation in equity prices during the declines associated with the Great Depression. 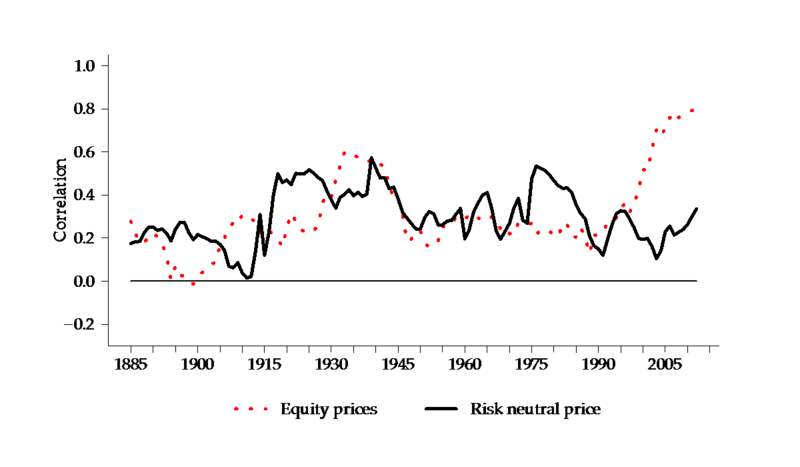 Abstracting from bouts of house price comovement associated with WW1 and WW2 housing busts, international house prices are also generally more correlated today than in previous decades. However, since the financial crisis, global house prices have increasingly diverged, slowing down the increasing synchronization of recent years. Overall and to varying degrees, the comovement in credit, house prices, and equity prices is higher now than in previous decades. In this sense it is possible to speak about a global financial cycle among developed economies. Why have equity prices become increasingly correlated across markets starting in the 1990s? We investigate the mechanisms that may explain this phenomenon by decomposing equity prices into two components. The first component describes how a risk-neutral investor would value equities based on the stream of future dividends (D) discounted by future risk-free rates (R): . Assuming a terminal value for at the sample end this risk-neutral component can be calculated recursively according to . The remaining second component then primarily describes an investor’s ability and willingness to hold risk. These two components are useful approximations based on traditional asset pricing concepts. 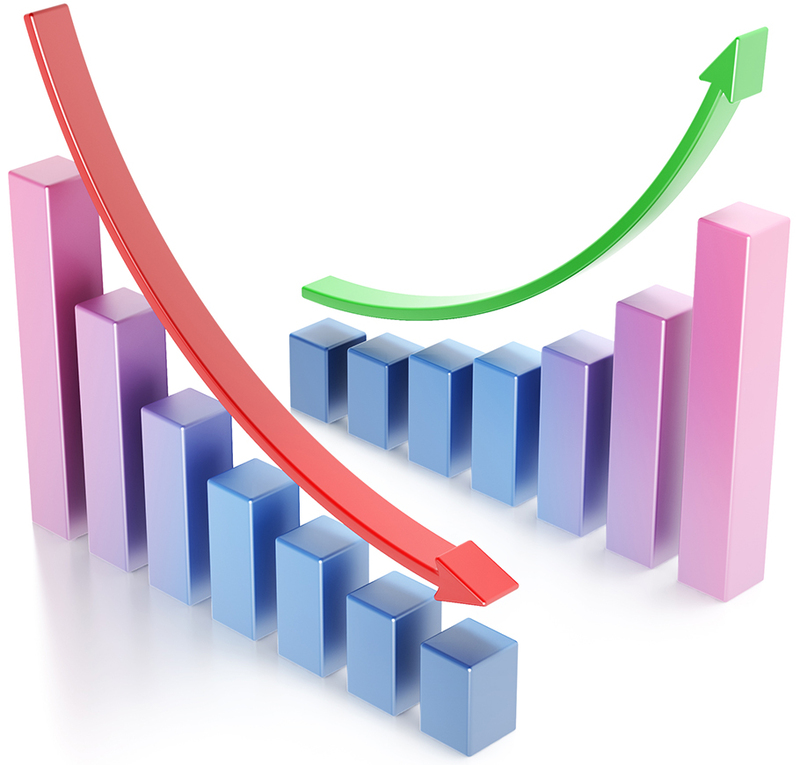 We label the first component the “risk-neutral price,” and the second component “risk-appetite.” Obviously, risk-appetite is a summary term that comprises a diverse range of forces, such as risk aversion, consumption habits, the ability of intermediaries to supply credit, as well as investor sentiment, to cite a few. Using each of these two components, we then ask how much of the comovement in equity prices is due to comovements in dividends and risk-free rates, and how much is due to the synchronization of risk-appetite based on our broad definition. Figure 2 shows that until the 1990s the comovement in equity prices was mostly accounted for by the comovement in the risk-neutral price component. Starting in the 1990s, however, it is the synchronization in the risk-appetite component that increasingly binds together equity prices among advanced economies. And it is difficult to overstate how dramatic that increase is when seen against the last 150 years of the history of modern finance. What might explain the increasing synchronization of risk-appetite across global equity markets? A popular view, often embraced by practitioners in financial markets, is that monetary policy in global financial centers (in particular the U.S. Federal Reserve) plays an important role in affecting risk-taking in international financial markets. This can occur through different channels. For example, if a Fed tightening lowers U.S. equity prices, this negatively affects the balance sheet of any bank that marks-to-market its U.S. assets, causing banks around the world to cut down their risk-taking in sync with U.S. banks. Alternatively, U.S. monetary policy may directly act as a focal point that synchronizes risk perceptions of international investors. One way to assess this view is to use local projections to examine how global equity prices react to a +1 percentage point (ppt) shock in financial center policy rates. We again distinguish between the risk-neutral price response of dividends and risk-free rates versus the response of equity prices themselves. The difference between these two responses measures the degree to which global risk-appetite responds to financial center monetary policy. Our measure for the financial center policy rate is the U.S. short-term rate after 1947, and the U.K. short-term rate prior to 1914. Between WW1 and WW2, we use the average of U.S. and U.K. short-term rates instead. Does financial center monetary policy act as a driver of global risk-appetite? Figure 3 provides the answer: The left panel shows the full sample results, while the middle and right panels focus on the two eras of financial globalization: before 1914, and after 1980. Our first result is that the response of equity prices has become stronger over time. The international response to a +1 ppt interest rate hike in the financial center has almost doubled from the full sample average of about -4% to the post-1980 trough of -8%. Importantly, the implied risk-neutral equity price, calculated from the dividend and risk-free rate responses, suggests that dividend and risk-free rate responses explain only about 25% of the post-1980 equity price response over 4 years. Fluctuations in risk-appetite are by far the most important driver, accounting for three quarters of the response. By contrast, before 1914, equity markets reacted to rate changes much as would be expected from a risk-neutral investor perspective. Equity prices declined in response to a +1 ppt increase of the policy rate of the Bank of England, but there is no major impact above and beyond the risk-neutral path. Thus, monetary policy in financial centers have become an important driver of global risk-taking and this is a new and recent phenomenon. Possible explanations a shift from gold-backed to fiat currency, a more prominent role of leveraged financial intermediaries as shock amplifiers, growing use of the dollar as a funding currency, and growth in cross-border banks in the world economy today. Risk-appetite spillovers of US monetary policy are substantial. Do floating exchange rates help countries avoid such spillovers? Floating exchange rates are thought to insulate domestic interest rates from foreign rates by allowing movements in the exchange rate to compensate for the interest rate differential across both regions. However, risk-appetite and hence equity prices might fluctuate more than the interest rates that determine the exchange rate. In this case risk-appetite fluctuations can overwhelm the insulation provided by floating exchange rates. To address this question, we analyze the response of global equity prices to financial center policy rate shocks conditional on a country’s exchange rate regime. The top half of Table 1 shows the international responses of equity prices for the full sample. The equity price response tends to be stronger for countries whose exchange rate is pegged to the USD, or pegs. Over the full sample, equity prices are down by 3% in year 1, while there is no significant response among economies that allow their exchange rate to freely float, or floats. A test for equality of the impulse responses confirms that historically, the response to center-country monetary policy changes has been significantly more pronounced for pegs. The bottom half of Table 1 shows the post-WW2 subsample results. As our previous results show, this is the period when risk premium spillovers were strongest. We find that for the post-WW2 sample the peg-float dichotomy is somewhat less stark. Equity prices for floats now also show a response to center-country interest rate changes, but on a smaller scale. Pegs on average still exhibit a much stronger response, based on point estimates. However, in this smaller sample, the precision of these estimates is weaker, and the difference between the two responses is no longer statistically significant. In sum, the transmission effects are stronger for fixed exchange rate regimes, but they are still sizable for floats. Over the past few decades financial comovement has reached historical highs. In particular, the post-1990 synchronization of equity prices cannot be easily accounted for by the behavior of fundamentals, such as dividends or risk-free rates, but instead must be attributed to global fluctuations in risk appetite. Moreover, we find that U.S. monetary policy has become an important driver of such fluctuations. Importantly, policy-makers in small open economies should not expect flexible exchange rates to fully insulate an economy against fluctuations in global risk-appetite.